Support the Terence McKenna archives! Terence McKenna (1946-2000) was an ethnobotanist, psychedelic pioneer, philosopher, and shamanic scholar who boldly explored the mysteries of consciousness and the fringes of reason with rigor, wit, and generosity. 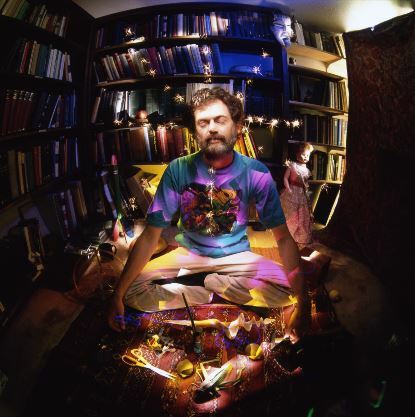 Now, Kevin Whitesides with support of fellow travelers like BB pal Erik Davis are working hard "to collect, digitize, transcribe, store, and preserve the imprint of Terence McKenna's presence" in all media for the ages. You can help! Support the Terrence MckKenna Archives GoFundMe campaign! The incentives you can receive for participating are quite mind-blowing. 2) A Transcription Project: to transcribe all of Terence McKenna's 500+ hours of audio/video material that is freely available on the web into a searchable database. This crowdsourced, volunteer-based project is already ongoing and incredibly successful and can currently be found at terencemckenna.wikispaces.com. If you would like to help contribute by transcribing Terence's talks, please join the effort there and on The Terence McKenna Transcription Project Facebook Page. 4) TerenceMcKenna.com: Terence's son owns this domain and it currently houses the Terence McKenna Bibliography, but we need resources and talent in order to build into the online McKenna hub that it can ideally be, eventually hosting the searchable transcription database, an online digital archive, and much more.